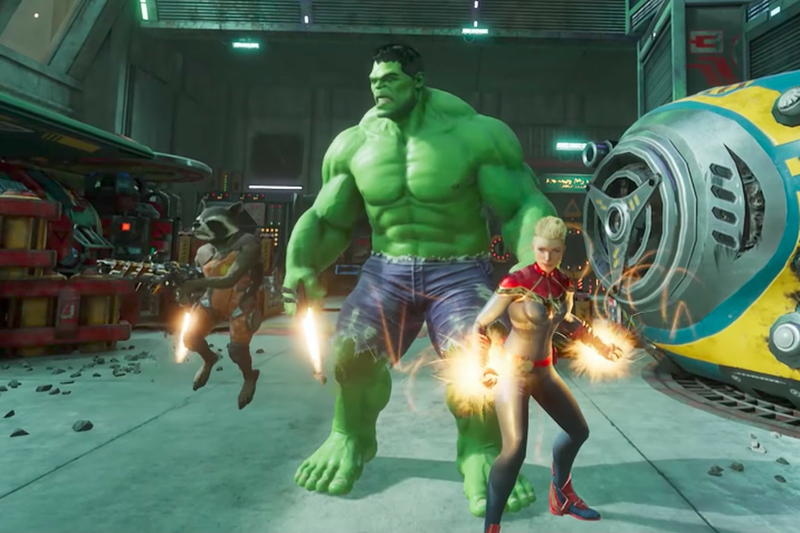 One of the more intriguing announcements to come out of Disney’s biennial D23 expo this past weekend was Marvel’s new virtual reality game, made in partnership with Facebook-owned Oculus VR. The title, called Marvel Powers United VR, is not due out until 2018 as an exclusive for the Rift headset, but we got the opportunity to try out an early build of it at the conference. 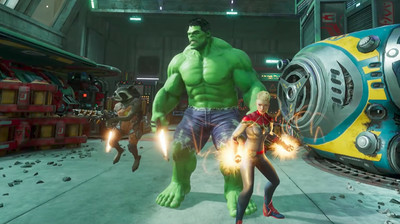 As you might expect, Marvel Powers United VR boasts several different characters of varying sizes, shapes, and skill sets, and when playing for the first time I could chose between Rocket Raccoon, Deadpool, Captain Marvel, and The Hulk. I looked down, and there were the familiar ripped purple pants. I curled my massive green hands into fists (the controls for Hulk were a fairly intuitive mix of the Oculus Touch’s grip and trigger buttons), and was impressed by the natural fluidity of the motions. But again — I just seemed to be a green dude with some ripped shoulders that needed some new pants. That’s when I glanced to my left: there, far below me, was Rocket Raccoon. He was diminutive, far smaller than when I’d seen him in Guardians of the Galaxy. I could have crushed him with my massive hands. Rocket smiled and gave me a thumbs-up, and that’s when the pieces started to fit together. I was the Hulk, alright. Rocket was so small because I was huge. That sense of scale is one of the most gratifying things about playing Powers United VR. The gameplay itself is pretty straightforward: players go through a series of rooms as a co-operative team, clearing wave after wave of Kree soldiers before fighting the big bad at the end of the level. Each character has a different set of powers, triggered by different gestures and button combinations. When playing as Rocket, I had dual pistols on each hip, a sighted rifle on my back, and a pair of grenades strapped to my chest. As Hulk, I had various smashing powers and incredible reach. But trying the two characters out in different rounds provided noticeably different experiences. It wasn’t just the way I smashed or shot my way through the chaos, it was the different angles and perspective I had when traversing the same rooms. While the fighting was fun, actually getting around was another matter. I played Powers United VR while standing up. Given that it’s on the Oculus Rift, we’re not talking about any kind of room-scale experience. Instead, I just stood static, with the joystick on the left controller moving me back and forth through the environment. The joystick on the right controller would let me change the direction I was facing in 90-degree increments, and when I was Hulk, I could take giant “leaps” across the room by holding down a button and essentially teleporting there. I’ve tried VR experiences with those same kinds of movement dynamics before, and they’re easy enough to acclimate to, but I often find them disruptive just from the perspective of maintaining immersion. I found the same thing to be true in Marvel’s Powers United. It basically comes down to a simple conflict that impacts many titles. Organic movements, like reaching down to my hip to pull one of Rocket’s pistols, or Hulk-smashing the heads of enemies, actually ground me in the reality of the scene I’m in. They’re not just random moments that trigger an outcome; they’re core to creating the illusion that I am in the virtual space and have real agency. Moving around with a joystick clashes with that on a fundamental level, because that’s not how we move in real life. Granted, I know this is just a game, and the solution is certainly functional — and perhaps the best option available given the technology of 2017. But it nevertheless bumped me out of the experience at several moments. When something as simple as Hulk’s shoulder, or the appearance of Rocket’s snout stretching out beneath my eyes, can do so much in creating the illusion, it’s a shame that something as fundamental as turning your body 180 degrees by flicking a joystick breaks it. That said, once I was able to leave that dissonance behind, I had a wonderful time playing Marvel Powers United VR. There’s a great sense of fun in running around as those characters, though my instinct was that it will be the multi-player aspect of the game that will make it worth replaying. Whether it was trading rude gestures with the person playing Deadpool, or simply making a ridiculous pose for the virtual “group photo” that ended each round, the game spoke to how entertaining and visceral group VR gaming can be. It’s certainly early for the project, but as a preview, there’s a lot to like.